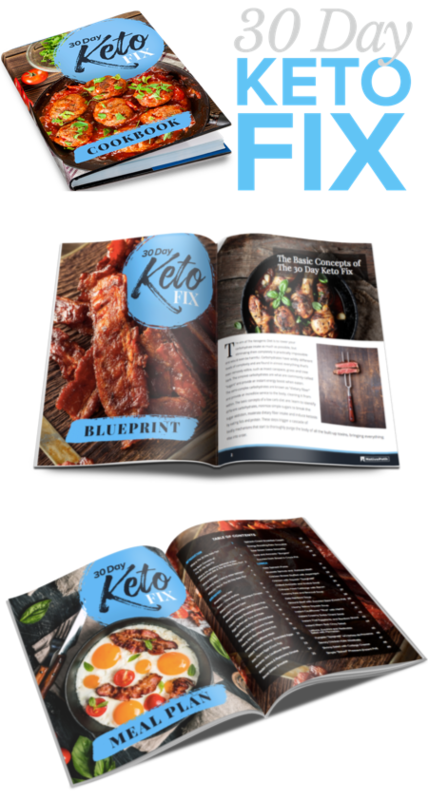 The 30 Day Keto Fix is the ultimate cookbook for beginners who want to be successful with the keto diet. Normally $21.99 + shipping, today we're giving away a limited number of physical copies for only $8.95 plus FREE shipping. This step-by-step, easy-to-follow 30-day guide allows anyone to get on the fast track to success with the ketogenic diet and lifestyle. Dozens of delicious and easy-to-make ketogenic comfort foods that make sticking to the keto diet a breeze. With all the meal planning done-for-you, all you have to do is open the book and go! The Ketogenic Diet is a special type of high-fat, low-carb diet designed to help the body tap into its alternative fuel source known as ketosis. When the body is in ketosis, it produces molecules known as ketones that burn fat for fuel. When the body is not in ketosis, it relies on burning glucose from carbohydrates for fuel instead. While extremely effective, the problem with the typical ketogenic diet is that it requires carb restriction to be effective. Which is it's not easy for beginners to get started with or stick to long term. As a result, the traditional Keto Diet just doesn't work for most because it isn't convenient, flexible, or practical for a majority of busy Americans today. The good news is the 30 Day Keto Fix makes it easy for anyone to get started with the ketogenic diet and lifestyle in the quickest and simplest way possible. With dozens of new and delicious ketogenic recipes and done-for-you meal plans, it's the ultimate guide for beginners who want an easier more satisfying way to be successful with the keto diet. Normally it costs $21.99 + shipping, but today, we’re giving away a limited number of physical copies for as low as $8.95. Plus you'll receive FREE shipping today. Includes The 30 Day Keto Fix Book: This step-by-step, easy-to-follow 30-day guide allows anyone to get on the fast track to success with the ketogenic diet and lifestyle. Save over 36% compared to buying each item separately! Includes The Ultimate Keto Meal Plan Collection: With all the keto diet meal planning and shopping list creation done ahead of time all you have to do is just open the book and go! Save over 73% compared to buying each item separately!